Civicplan receives OPPI Excellence in Planning Award for innovative community engagement. Civicplan’s innovative community engagement has won a provincial planning award. Recognizing excellence in all its forms, OPPI celebrates professional planners and outstanding projects annually through Excellence in Planning Awards. These are widely regarded as among the most prestigious awards given for planning achievement in Ontario. They celebrate the role of Registered Professional Planners (RPPs) as integrator and visionary in the space between government planning policies, the public, and other regulated professionals. 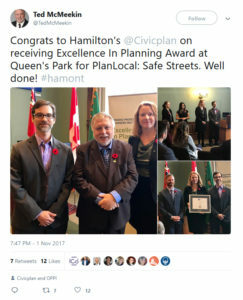 The Ontario Professional Planners Institute (OPPI) announced the 2017 winners of the Excellence in Planning Awards at an event held at Queen’s Park. The Excellence in Planning Awards recognize innovation, creativity, professionalism, problem solving, and communications in urban and community design, planning studies or reports, and public education. These are the best of the best in urban and rural planning across the Province. “The 2017 OPPI Excellence in Planning Awards celebrate the very best of planning and role of Registered Professional Planners (RPPs) to improve and strengthen the communities across Ontario. RPPs are the professionals specifically educated, trained and ethically committed to guiding decision makers, stakeholders and the public along the better-informed path to inspired communities in the public interest. Today’s award winners showcase those who are leading the way in shaping sustainable communities,” says OPPI President, Jason Ferrigan, RPP, who presented the awards. Civicplan wins the International Association for Public Participation (IAP2) Canada Core Values Award for Extending the Practice through Creativity, Contribution and Innovation in the Field. Civicplan wins the Community in Motion Award recognizing work on promoting pedestrian mobility and a pedestrian-friendly environment.